Tarragona is a city located in Catalonia on the Costa Dorada in the north-eastern corner of Spain. Tarragona is the place to come and enjoy a city break where you can enjoy the museums, fine restaurants beaches as well as golf. It has a wide range of activities on offer for the whole family to enjoy and is also a good place for a summer holiday. Just look at this amazing must-see video to see what you can see and visit!!! 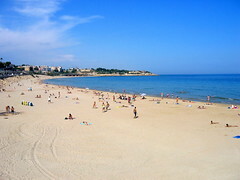 Tarragona is located to the south of Barcelona which because of its airport is a major hub servicing arriving tourists. Reus Airport which is only thirteen kilometres away from Tarragona is serviced several times daily by carriers such as Thomson, Thomas Cook and Ryan Air from UK airport such as London Gatwick, Birmingham, Cardiff, Newcastle and Belfast. Culturally Tarragona also has a lot to offer, you can visit the Cathedral, Roman Circus, Amfiteatro Roma, Passeig Arqueologic, Real Monasterio de Santa Maria de Poblet, Miravet Castle, Roman Aqueduct, Museu Necropolis, Casa Castellarnau, Golscinc and the Tarraco Art Gallery. Tarragona is great for a city break or family beach holiday very much in the same vein as can be enjoyed in the great Spanish cities of Barcelona and Valencia. To play golf you have to head to the south of the city where the Parking Sur Aventura is located. Further golf courses include the Club de Golf Reus Aiguesverds, Golf Par 3 Cambrills and the Club de Golf Costa Dorada. The popular theme park of Port Aventura is also situated to the south of the city. Port Aventura is open from March until the end of October, and then every weekend until the end of January. The park is only closed during the month of February. For more information on the theme park or water park or booking a hotel on the complex you can look at http://www.portaventura.co.uk. Another water park is located in La Pineda to the south of Tarragona. Aquopolis is open from mid May until the first week of October. Day passes start at €16.50 for children and €22 for adults. Season passes can be purchased for €55 so if you intend to visit the park more than twice you will have saved some money. For more information you can look at http://www.costa-dorada.aquopolis.es. Aqualeon is the only theme park in Europe where you can go on safari and enjoy the services of a water park as well. Rates start as €10 for the day for children and €12 for adults. The safari park is open all year round while the water park is open from May until September. You can research Aqualeon in greater detail on http://www.aqualeon.es. Tarragona has a number of fine beaches and the best ones to enjoy are Arabassada Beach, Cala Crancs, Cala Font, Capellans Beach, Penya Tallada Beach, Llarga Beach, Playa Larga, Llenguadets Beach, Llevant Beach, Playa Miragla, Ponent Beach and Savinosa Beach. Top Tarragona hotels start from as little as €45 a night and accommodations which have been recommended include the La Grava Hotel, Hotel Sant Jordi, AC Hotel Tarragona by Marriott, Hotel de la Font and the Hotel Ciutat de Tarragona. To enjoy the best of both worlds such as an apartment and hotel you need look no further than the Alexandra Hotel which starts at around €48 a night and comes highly recommended. Tarragona has some really good Spanish restaurants as well as international ones to enjoy and highly recommended eateries include La Cuineta, El Terrat, Barquet Arcs Restaurant, La Grava, Palau del Baro and Sol-Ric. Nightlife revellers will find more than a few choices to dance the night away at. Arsis, Discoteca Totem, Sala Zero, Shiva Music and Sala Loop.